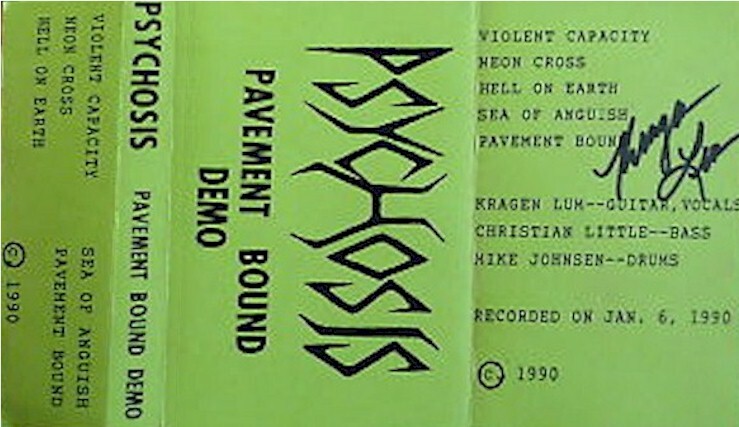 Psychosis was very active in the L.A. metal scene in the early 90's. Formed around 1988, combining influences from the Bay Area scene and some slightly more progressive elements, they gained notoriety throughout the area and far beyond across the world by corresponding with the fans and the media that garnered them fantastic reviews. Released one demo in 1990. A full length titled LifeForce was released in 1992. Printed covers on thick paper. Tapes had printed stickers on one side of the shell.